Oulun Purjehdusseura (OPS), Oulu Sailing Club, was founded on August 10th, 1881 by decree of the Imperial Finnish Senate. It is one of the oldest sailing clubs in Finland. The Yacht Ensign flown by the club was also registered in 1881, and displays the 16th century Oulu Castle and a salmon. 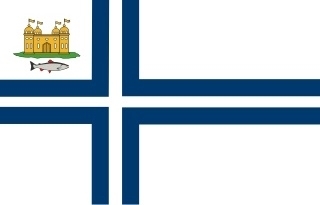 It is an official registered naval flag for Finland. The club has over 300 members and over 130 registered vessels. The current location in the Johteenpooki marina (N65o00’9” E25 o26’5”) is the third site for the club. Johteenpooki has excellent facilities for our members, including boat ramp, 8 ton crane, docks with electrical hookup and water, waste disposal, shower/sauna/toilet facilities as well as a club house which is available for hire. Channel depth to the marina is 2.4 meters. 5 guest docks are provided. We also have a well appointed club house & sauna on the island of Röyttä, 20nm north of Oulu. Röyttä (N 65º 16'2" E 25º 12'4") has a very secure marina with 80 boat slips.